p>There are three ways to win the league in my view. It doesn’t matter what the league is, essentially the characteristics are all the same but to be successful you have to either a) Have someone (individual or group of people/company) who are willing to spend significantly more than anyone else; b) Invest heavily in the best infrastructure you can that will then work your assets (players) more effectively or c) find a way of playing that other teams simply cannot handle. There have been lots of examples of A’s in our time, few of whom ever last the course. Titles may be won but after a while the money dries up (or disappears), the investors realise that there is no Return on Investment or simply get bored. Remember Gretna? Probably not. But they went from the Junior Leagues in Scotland all the way to the Premier League (and Europe) off the back of one man’s money. When he died, so did the dream and ultimately the club. The Non-Leagues are full of stories of blind ambition, foolhardy investments and ultimate failures. In the case of B’s sometimes the success takes longer but when it arrives it gathers pace. Good players do not always want to play for the money (shock, horror). They will join teams with ambition but also those with the best facilities. Swansea City are a good example here. Part fan-owned, they have risen through the leagues not off the back of massive investment, but with the help of improvements in their infrastructure. Finally, the C’s. Much harder to find these days when every move on the pitch is watched by hundreds of eyes (in the case of Non-League) and smartphones. Wimbledon and Cambridge United are two clubs that rose up the leagues and became massively successful by playing in a particular style that other teams were too unprepared to handle. 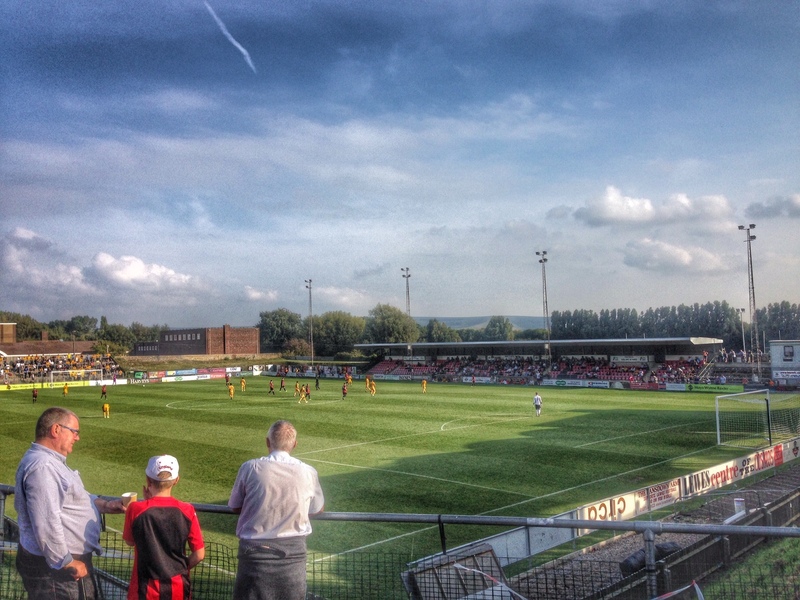 Today, Lewes host Ryman Premier League leaders Maidstone United. They are most-definitely in the B catagory. Having fallen as far as they could after a brief spell in the Football League, they are now on the rise again thanks to the facilities they have built. The Gallagher Stadium is their kingpin. A 7 day a week, 52 weeks of the year money making machine. The cash is invested in improving facilities, developing the academy side of the club and of course on player wages. Sustainable growth that was only halted last year by the narrow-minded, selfish views of the Conference clubs in voting against 3G pitches. Less than a year later and the sentiment has changed and they are all of a sudden welcome again (noting to do with the Football League and FA clarifying their positions of course). With promotion now a possibility is it any wonder that the Stones have won 10 out of their 11 league games this season? Oh, and recorded a 10-0 win in the FA Cup. When we hosted Margate (definitely in the A catagory by the way) a few weeks ago their post match celebrations weren’t for the 5-1 over us it seemed but for the fact the Stones had lost away to Tonbridge Angels. Four games into the season and such paranoia? Last season Lewes took 4 points off the Stones, keeping two clean sheets in the process. It is fair to say that in the game at their place in August, with the traditional summer rain putting the completion of the game in doubt despite the artificial surface, we parked the bus. Not taking anything away from the Lewes back four, which included two centre-backs who had a combined age of nearly 75, but we put men behind the ball and played on the counter attack. It worked. In the reverse fixture Maidstone were well and truly beatenn, their game plan cruelly exposed by some scouting information (ahem). 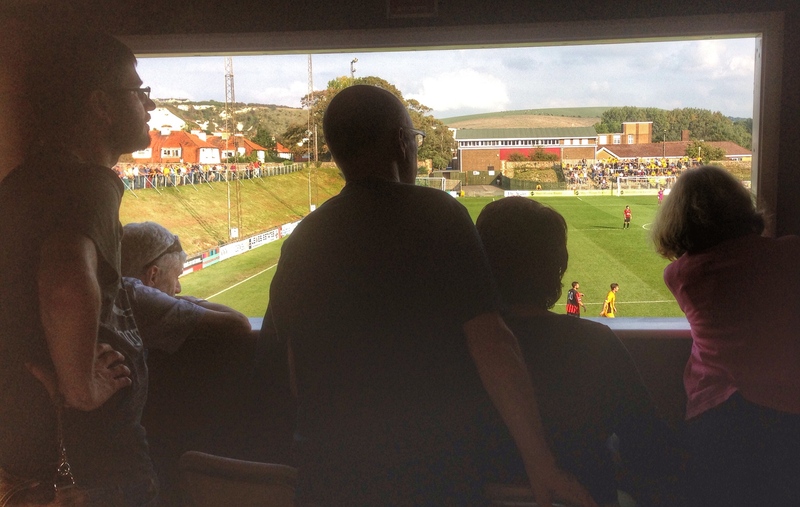 Whilst Maidstone’s form was stellar, Lewes’s has been too shabby either. Unbeaten in five games with four consecutive clean sheets is certainly rare for us Lewes fans, and with some of our long-term influential absentees returning soon from injury and suspension, things are looking up. With the thunderstorms clearing and the promise of Stoke City v QPR on the TV as pre-match entertainment a bumper crowd was expected. This was our first clash with Brighton & Hove Albion this season as they were taking on Blackpool. We try our hardest to avoid such clashes, knowing the impact it has on our friends down the A27 but sometimes they just wont listen and move their fixture. 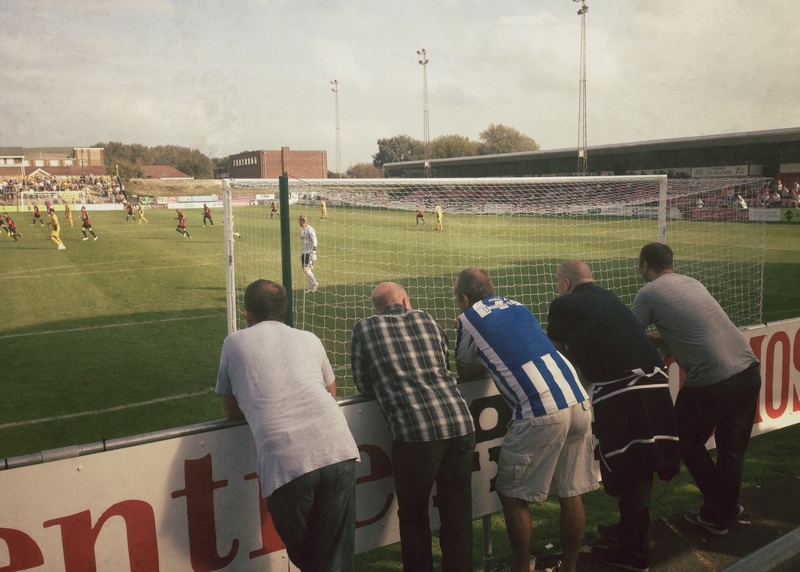 We track our attendances closely and whilst we would lose around 50 fans to the Amex, Maidstone’s travelling support would more than make up for the short-fall.Lewes 0 Maidstone United 2 – The Dripping Pan – Saturday 20th September 2014“I never thought of losing, but now that it’s happened, the only thing is to do it right. That’s my obligation to all the people who believe in me. We all have to take defeats in life. ” A quote that sums up the afternoon but not from Garry Wilson or Danny Bloor but from Mohammed Ali. There was no shame in being defeated to The Stones this afternoon, on a beautiful sunny afternoon although Lewes will be disappointed that the possession they enjoyed for most of the first half didn’t lead to anything. A decent, season-best, crowd of 621 saw a finely matched first half, although it was the 150 or so travelling fans who celebrated at the final whistle, finally breaking the seal over the Lewes goal that had lasted for over 7 hours. The first half saw possession switch between the two teams, with Rikki Banks being the busier of the two keepers although the main talking points, alas, were around the performance of the officials – a referee who couldn’t see incidents happening in front of his eyes and a linesman who seemed to think he could make decisions whilst being 30-40 yards away from the action. 0-0 at half-time was a fair score but we knew that unless we scored early in the second half, Maidstone would rise like a wounded animal. And so it was. A poor headed clearance from a Stones corner saw the ball fall to Alex Flisher who smashed the ball across the area into the bottom corner. Lewes responded quickly and the main talking point was a bizarre decision when Nicky Wheeler’s beautiful chip hit the inside of the post and seem to be over the line before Worgan grabbed it. The linesman, mirroring the performance of his colleague in the first half, raised his flag which at first we assumed was to signal a goal. Yet it appeared he was flagging for offside. Let’s rewind. Wheeler is 15 yards out, with defenders and the keeper in front of him when the ball falls at his feet, he beats the defender before chipping the ball to the far post. No other Lewes player is near the ball as it sails over the keeper or when it hits the post. So exactly who was offside? Maidstone’s second comes from another strange decision, when Wheeler was fouled yet the referee saw the offence the other way. Ten seconds later Phillips had buried the ball in the Rooks net. Game over. The Stones go rolling on. The defeat sent Lewes back into the bottom four. Has the panic button been pushed? Not at all, we pick ourselves up, dust ourselves down and get ready for the visit of VCD Athletic on Wednesday.